Hello! 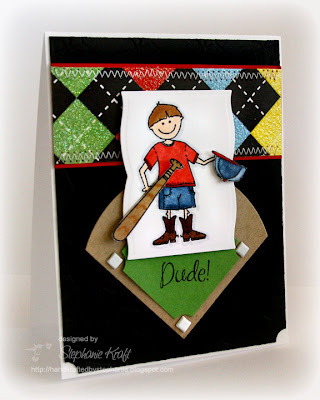 I have another Whipper Snapper card to show you today. This one uses Anna Wight's newest set, His Favorite Things. 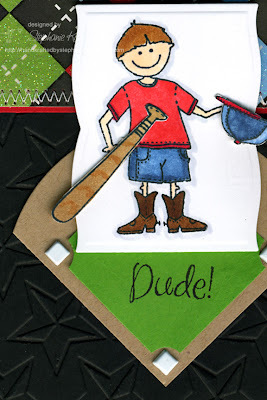 I just love this boy image, especially the fact that he's ready to play ball in his cowboy boots! Since it's playoff time, I was inspired to create a baseball themed card. Try as I might, I just couldn't get a good shot of this card. The black panel is actually embossed with my Cuttlebug stars embossing folder (though I chose to use the backside -- the debossed side?). Here is a close-up of that (you may have to click on the photo to enlarge). I hope you're having a great weekend! Thanks so much for stopping by! Accessories: Circle and Labels Seven Nestabilities (Spellbinders), Star embossing folder (Provo Craft), Square punch (Marvy), Ticket punch (SU! ), Markers (Copic), Square brads, Foam tape, Thread, Sewing machine. Had to laugh about the boots, lol...but such a darling boy set! very cool! Love the strip of DP! and the stitching detail! !